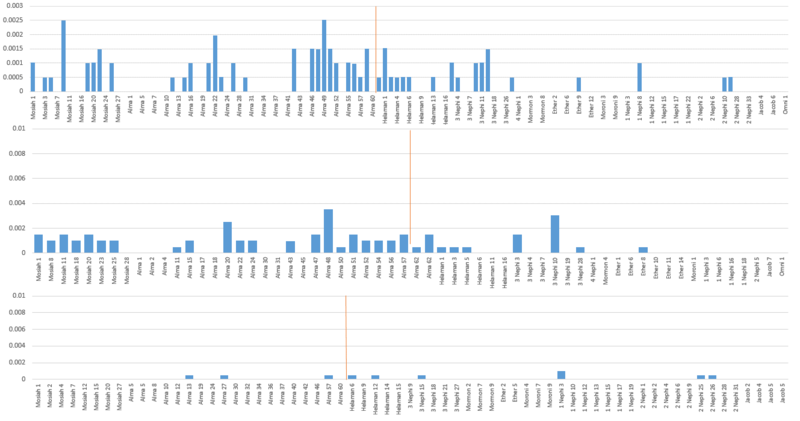 About a year ago, I put together a database, splitting up the Book of Mormon electronic text, and spent some time doing computer wordprint analysis. I’m not a statistician or an expert in word print studies, so my studies will need to be validated by an expert. But I think I have produced a good model of how to understand the multiple voices within the Book of Mormon. 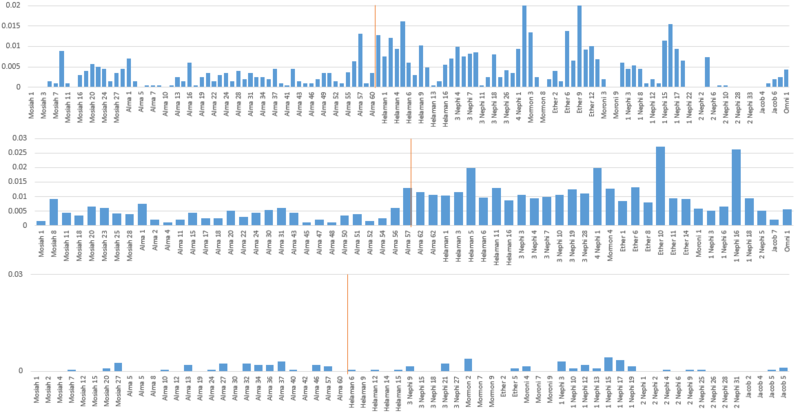 I wrote a series of blog posts in 2016 as I was doing analysis. The Book of Mormon Central released a fun youtube video on a BYU BOM word print study, and that prompted me do a mini critique of that, and give a summary of my project to date. 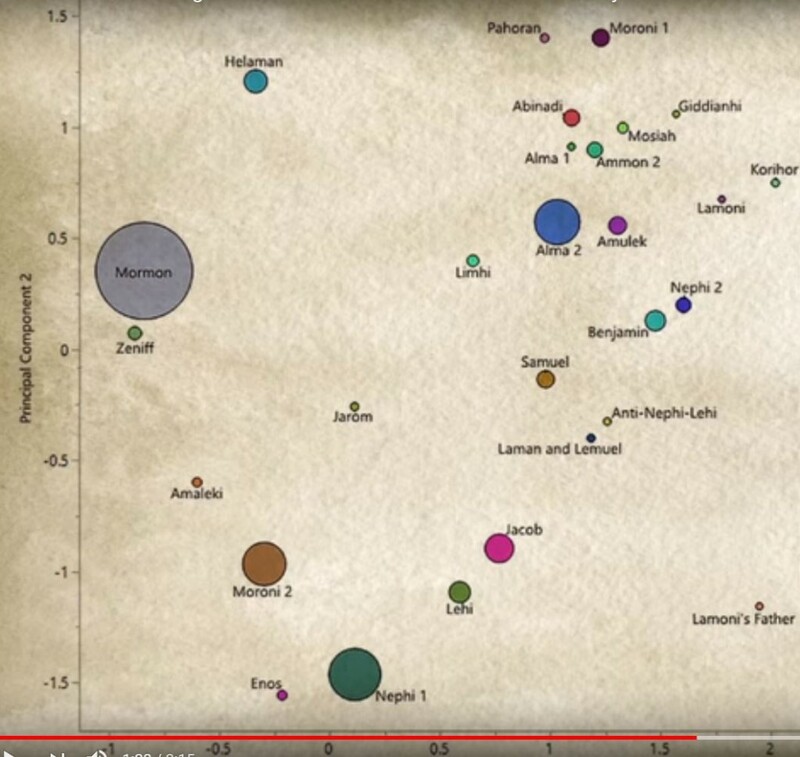 Book of Mormon Central addressed this in a post about a month ago, but what was new in this video was a chart, which I was told is from an ongoing BYU research project by Matthew Roper, Paul Fields, and others. These are identified as statistically unique voices, and the claim is made that this combined voice diversity is greater than 8 total novels from four 19th century writers (Cooper, Dickens, Austen, Twain). Huck Finn has a unique voice compared to Tom Sawyer. And Austen’s Elizabeth Bennett and Mr. Darcy have unique voices. 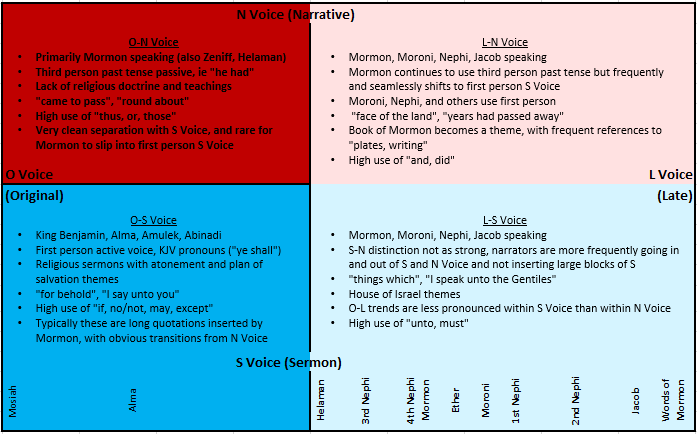 And when you take all the voices of 8 sample novels, they have many unique voices, similar to the chart below, but the combined diversity of all 8 is even less than the Book of Mormon. Impressive! Then I saw the chart below which jumped out at me, because it displays the exact same concept I had been trying to illustrate in my many blog posts on my own wordprint study. Each voice of the BOM is charted along two axis to display different aspects of uniqueness. Here’s a chart I created from my model. Pretty close. 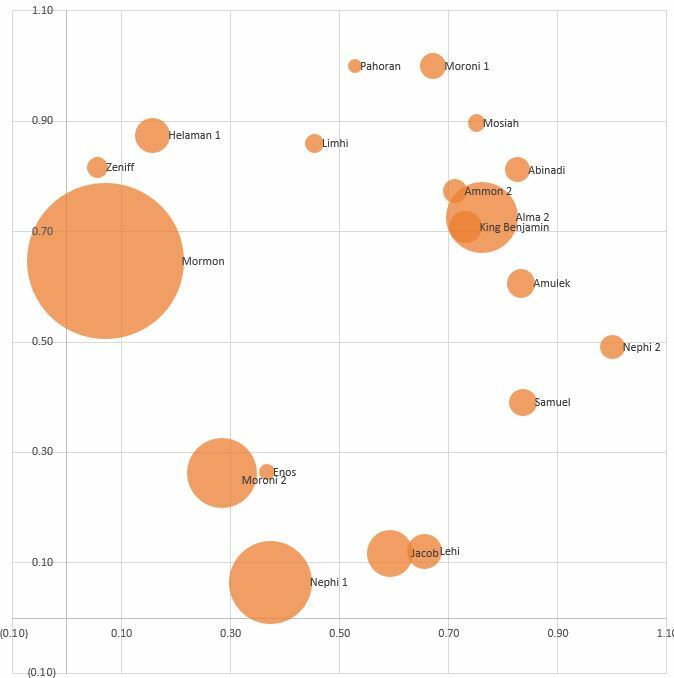 The big bubbles (size of bubble correlates to total words attributed to this voice in the BOM) Mormon, Moroni, Nephi, and Alma are all generally in the right spots. Even the small bubbles (Enos, Zeniff, Helaman, Samuel, Abinadi) are in the right spots relative to the larger bubbles. I don’t know the Roper study methodology, but I will bet dollars to donuts the distinguishing elements of the voices in Roper study and my study can be explained by the same underlying trend, which I will illustrate in this post. We’ll come back and break down this chart more later, but now I’ll explain my model. If you’re a glutton for punishment or end up really confused, read these posts from 2016 for more detail. If you want to skip the technical analysis, you can jump down to the bottom to go back to the Roper Chart analysis section heading Book of Mormon Central Chart Analysis. Many years ago, based on my own reading of the text, and confirmed when I looked at BOM wordprint studies (both for BOM historicity and against), I developed a theory that the Book of Mormon could best be analyzed by splitting up the narrative (I will call this N Voice) portions and the sermon (I will call this S Voice) portions. I split up the Book of Mormon verse by verse S Voice vs N Voice. 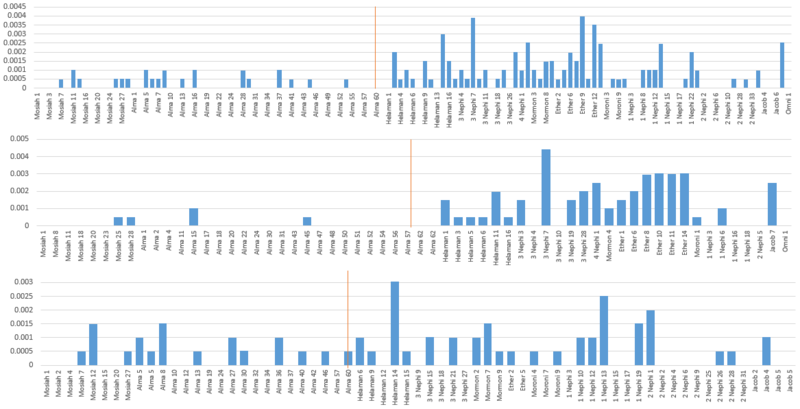 Here is a chart covering Mosiah and Alma (the first translated books of the BOM we have today) of the breakout by chapter of percentage each of S and N.
Special note on Mosiah priority: The Mosiah priority theory is that after the 116 pages of Book of Lehi were lost, the translation continued with Mosiah and then the small plates were translated last, so the order they were produced is Mosiah first then Alma through Moroni, then 1 Ne, 2 Ne and ends with the small books after Jacob. I will always talk in terms of Mosiah and Alma as the beginning of the book. And the small plates (1,2 Nephi, Jacob) last. This will be confusing if you don’t remember that. 2 But he did also mourn exceedingly because of the iniquity of those who had driven Pahoran from the judgment-seat, yea, in fine because of those who had rebelled against their country and also their God. (sorry for more complicated charts. This is frequency of the phrase “began to” per 1,000 words. Top chart is total BOM. Second chart is N Voice isolated. Third chart is S Voice isolated. You can see this is a common phrase in the N Voice and missing in the S Voice. “round about” Same charts mapping the phrase “round about”. As you can see, “round about” was a common N Voice phrase until 3 Nephi when it disappears. This will be explained in the “L Voice” section. A characteristic of the N voice is that it is purest or most noticeable and distinguishing is in the first half of the book, ie Mosiah, Alma, and Helaman. S and N are still present in the last half of the book, but they are blended together a bit more and the effect is not as stark as in the first half. S Voice is the sermon portions, where the narrator (usually Mormon) quotes or inserts words from a prophet, in the form of quoting sermons, letters, etc. Here we have Mormon speaking in v. 2 in N Voice, ie third person, past tense and a passive voice. Then we have a transition. Starting in v. 3, we have a large block of S Voice. Alma is speaking. He is speaking in first person, using active voice and present tense. All of the vocabulary and grammar trends change, and the topic of subject matter changes from narrative to doctrinal exposition. This trend continues through the end of the book but is purest in the first half (Abinadi, King Benjamin, Alma, Amulek). For example, the phrase “demands of justice” is a phrase that doesn’t appear in the King James Bible and appears to be a phrase introduced or at least popularized in the modern Protestant era. These verses that contain the phrase in the Book of Mormon are from three different voices but sound very similar. Having ascended into heaven, having the bowels of mercy; being filled with compassion towards the children of men; standing betwixt them and justice; having broken the bands of death, taken upon himself their iniquity and their transgressions, having redeemed them, and satisfied the demands of justice. And thus mercy can satisfy the demands of justice, and encircles them in the arms of safety, while he that exercises no faith unto repentance is exposed to the whole law of the demands of justice; therefore only unto him that has faith unto repentance is brought about the great and eternal plan of redemption. And now, the plan of mercy could not be brought about except an atonement should be made; therefore God himself atoneth for the sins of the world, to bring about the plan of mercy, to appease the demands of justice, that God might be a perfect, just God, and a merciful God also. The theory is that all the S Voice BOM contributors: Abinadi, Alma, Benjamin, and others are the same voice. This comes largely because of the S Voice characteristic of commonly using rhetorical questions in the preaching style. 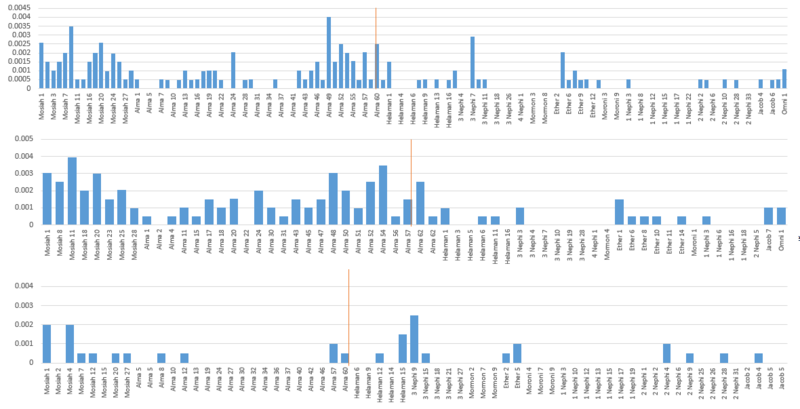 Six times more common occurrence, and even distribution across all S Voice speakers, is quite remarkable. I tried to illustrate vocabulary and phrases that aren’t cherry picked due to context. ie “I say unto you”, any verb in present tense, any first person prepositions like “you, ye, I, we” have much higher frequencies in the S Voice, but that would be obvious due to context. Words and phrases like “except”, “somewhat, or “these things” don’t seem intuitive like that, and so are better to illustrate this S vs N Voice phenomenon. I noticed while breaking out S and N Voice, that about halfway through the book, some of the patterns changed. I also remember seeing the analysis of the wherefore-therefore phenomonom in the Book of Mormon that Brent Metcalfe first noticed. After more analysis, I changed my two voice theory to account for this third “Late” Voice. increase in vocabulary and topics related to House of Israel, Jews, Gentiles, etc. increase in vocabulary and topics related to the Book of Mormon writing process itself: “plates”, “writing”, etc. I have two theories how this might have come about. 1) There was a preexisting consistent text of S-N. Another author took it and modified it. If you are familiar with the Old Testament Documentary Hypothesis, compare this in a way to J vs E, which is later redacted by P.
2) One author wrote the whole thing and L Voice represents regular voice creep that some authors have. I built a model scoring each chapter with an L Voice score. I’m trying really hard not to cheat the system. I decreased the natural impact of “wherefore-therefore” and used dozens of n-grams in the model. 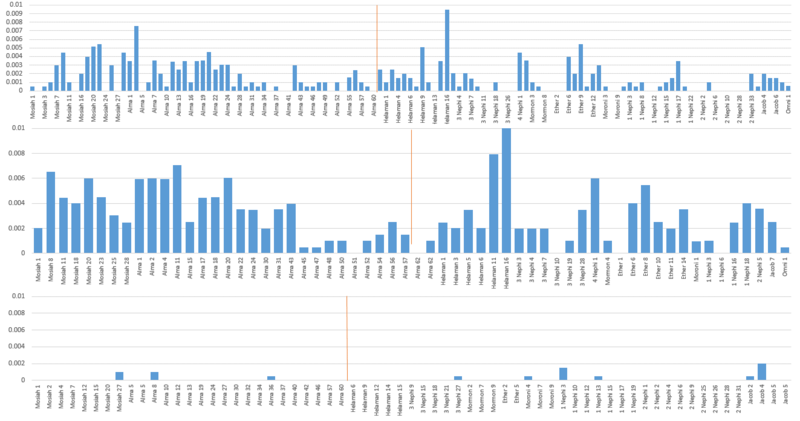 This is result of the trend by chapter. This is charting the use of “I, X”, as in “I, Nephi”, “I, Moroni”, “I, Mormon”, “I, Alma”. The trend is strong in all three: Total, N isolated, and S isolated. This illustrates what I found to be a strong, prevailing trend. The L voice creeps in slowly and then maximizes in Nephi. I use the Book of Helaman as the start of the L Voice, but with some phrases, it seems to start more like Alma 50ish. This covers Mormon, the narrator, and Mormon speaking first person in S Voice, which he does more often, starting in Helaman. It covers the Savior’s visit to America in Third Nephi. It also covers Moroni narrating the Jaredite story, and Moroni’s insertion of letters from his father, and his preaching and narrating of his own story. We then start over with Nephi telling of his story, we have Lehi’s voice with Nephi quoting his father for long passages, Jacob’s preaching in 2nd Nephi, and Nephi’s preaching at the end of 2 Nephi. Then Jacob’s narration and preaching, Enos, and then the minor record keepers Omni, Chemish, etc, and then ending with Words of Mormon. I exclude all of the Isaiah chapters and other chapter length quotations, such as Matthew and Malachi. This came out of the interesting work Skousen-Carmack are doing on Early Modern English grammar and vocabulary in the Book of Mormon. Every time I hear something that could be pattern or trend based, I do a test with my model, and it usually shows strongest in one of the three voices S,N,L. This is a chart of the frequency of the phrase did + verb. ie did go, did eat, did march, did join, did come, etc. The frequency pattern that is most interesting here is by isolating the N Voice in the second chart, since this pattern rarely occurs in the S Voice third chart. Here’s an example that goes the opposite direction. This form of grammar, ie “he caused that”, seems to fall out of favor in the Book of Mormon in the L Voice. I am calling this the Three Voice Hypothesis. There are two distinct voices S (sermon) and N (narrative). S is written by the same author. Alma, Amulek, Samuel the Lamanite, etc are sub voices within S, but they are alike enough that they are likely authored by the same author. N is written by the same author. Mormon, Zeniff, portions of Helaman’s writing. This is all written by the same author. Then a third voice emerges partway through the book around the beginning of Helaman. Moroni in Moroni 7, Lehi in 2 Ne 2, Jacob in 2 Ne 9, and Nephi in 2 Ne 31 are also all likely written by the same author of the S Voice. However, this new L Voice that appears halfway through the book appears to insert different vocabulary and grammar patterns and topics. 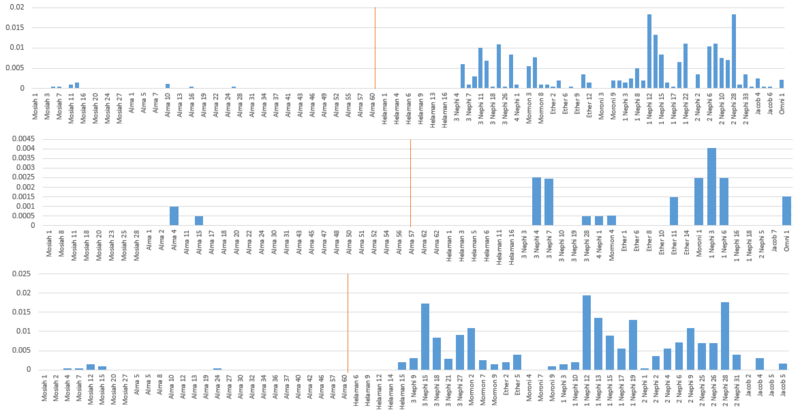 The following table shows frequency per 1,000 words in the four quadrants. A table like this was used to produce the scoring model I use to place the BOM authors-voices on the bubble chart. The logic for the Roper study must correlate to this same method. One of the distinguishing factors of the Book of Mormon is its intertextuality of the KJV Bible. The Isaish chapters are obvious. And the snippets here and there are somewhat obvious like 2 Ne 9:7’s “corruption could not put on incorruption” obvious correlation to 1 Cor 15:53 “corruptible must put on incorruption”. But the amount and complexity of the intertextuality with the KJV is likely underappreciated. See this post for a more in depth treatment. I went in with a theory that the intertextuality would be stronger in the S Voice than N Voice. But I didn’t find that. The BOM widely quotes and uses KJV language, and there doesn’t seem to be any pattern of this across the N,S, or L Voice. 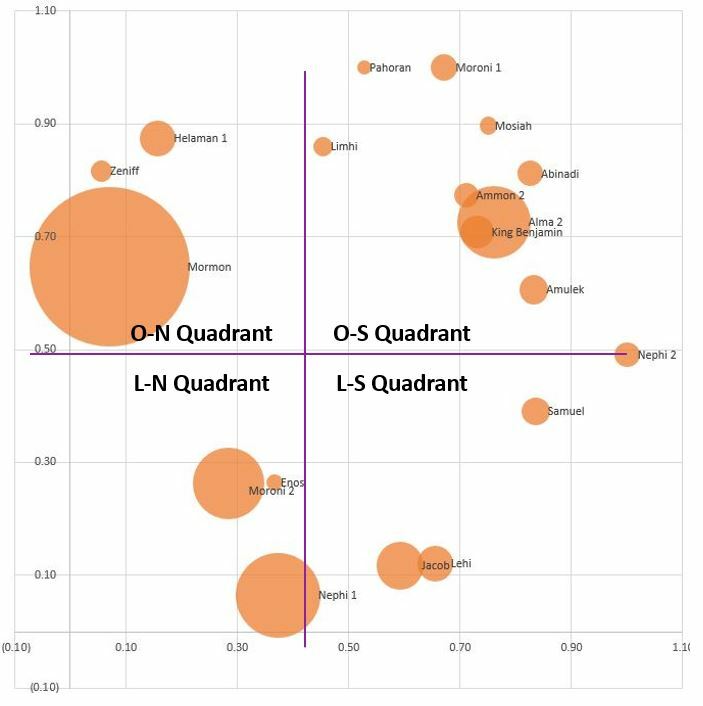 Now with this model and the idea of the four quadrants, let’s go back and look at the chart from the Roper Study. The location of the voices make perfect sense, according to the Three Voice Hypothesis quadrants. Mormon, Zeniff, and Helaman 1 are the N voice of the first half of the Book of Mormon. Alma, King Benjamin, Abinadi, Amulek are the S Voice of the first half of the Book of Mormon. Moving down to the Late Voice, the last half of the Book of Mormon, we see the narrators Moroni, Enos, and Nephi that focused primarily on history/narrative. On the S side of it, Nephi 2 (from the Book of Helaman) and Samuel are early L Voice Sermon followed by Jacob and Lehi with heavy L Voice scores. This chart is the most illustrative of this entire article. It’s a little complicated, so focus with me here, and it will make sense. For this, I split Moroni, Jacob, and Nephi into N and S. Each of these authors wrote narrative and each took opportunities to preach in the Sermon voice. Further, I took Mormon and separated him out not only N and S, but also Original Voice and Late Voice, by cutting off at the beginning of Helaman. Mormon is the only author that crosses both Original and Late sections. These results are remarkable. All the splits land perfectly where they should based on the theory. Mormon’s four sections land in each of the four quadrants. Zeniff now matches up almost perfectly with Mormon’s early/original N voice. 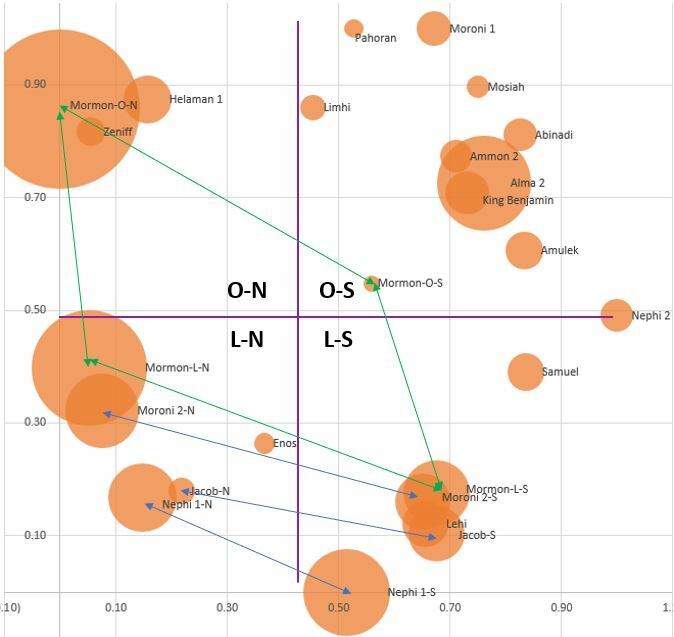 And Moroni and Mormon now overlap on both the N and S.
The Roper study makes the claim that the variation of the various Book of Mormon voices exceeded the combined variation of the four 19th century fiction authors. However, simply breaking down Mormon’s four “voices”, we see he alone accounts for a large portion of this voice diversity. If Mormon wrote all the writings in the Book of Mormon he is attributed to in the book, then it appears he alone has the ability to create the voice diversity within the BOM. My work needs to be reviewed by an expert (which is harder than you think–we’ve had a lot of bad BOM computer studies over the years), but these are my personal conclusions based only on the data analysis. There are no more than three unique authors (contributors?) to the BOM. The variations between the S-N-L can be sufficiently explained by my model, and the homogenity and unique vocabulary patterns within the voices appears to be strong enough that it’s unlikely there are more than three unique contributors. The BOM prophets Mormon, Moroni, and Nephi transform their own voice across these voices (from N to S and in Mormon’s case even adding L), in a way that has similar variation that LDS researchers have formerly attributed to statistically unique voices. No traditional faithful explanations can explain the multiple voices. The best faithful explanation is that there are no multiple voices, and the voice is Joseph’s voice that comes through with translation. More research and comparison with other works should be done to determine 1) if the distinction between S and N is normal for one author and 2) if the concept of voice creep can adequately account for L. Statisticians should be aware of the logical explanations for the three voices, and account fully for this in studies. ie remove any variation that correlates to the S-N distinction. OK, this is great, but give me some theories. This is my favorite theory, because I think it perfectly fits the data. But worst theory because historically it’s been well debunked. And the nature of the conspiracy makes it just too implausible. The idea here would be Solomon Spalding wrote the N Voice. It’s a cohesive narrative with Mormon as the primary and maybe only narrator. It’s religious in nature in that it shows the Native Americans descend from Israelites, but it’s not preachy. Sidney Rigdon finds/steals Spalding’s manuscript. Then Rigdon spends years inserting well polished 19th century style sermons especially including his Campbellite doctrine, in the form of various calls out from the narrative. Rigdon spends years working this over. Then Smith-Cowdery somehow get it and stage a translation process. Partway through the “translation”, one or both gets braver, and starts inserting their own voice. This is the L Voice. They greatly expand the story of Jesus coming to Nephites. They add on Moroni. They start over with Nephi and that becomes pretty pure L Voice form. They still have the Rigdon-Spalding material, but the purity and distinction of the N and S contrast that’s so stark in the first half is gone. Mormon wrote the entire book. Mormon massaged what he had from Alma, Benjamin, Samuel, and attempted to mimic a separate voice for it. Maybe when the Savior visited the Nephites, He introduced the themes strong in the L Voice. Mormon naturally creeped in his style (partial L) and also adapted his style to promote the themes Jesus introduced. Moroni was influenced by his father’s style late in his life. The voice of the Small Plates authors was unique and randomly correlated to L, but also maybe Joseph expanded or loosely translated. Or maybe the L Voice is purely Joseph (or Oliver) through an expansion. The record is ancient, but all voices are Joseph’s as he translated in his own language. He used his own language as he translated. He mimicked a different style for the sermons in S Voice. L Voice: his style creeped as he went, possibly being guided by the Holy Ghost to focus on certain themes. Similar to above but there is no underlying ancient record. S-N distinction is intentional and the L Voice may be unintentional and natural voice creep. Or if it’s a conspiracy, the S-N is Joseph and Oliver provided the Late Voice contribution. Or vice versa. This is the conclusion of the Book of Mormon Central team. The 20+ voices in the Book of Mormon represent unique authors. I feel this is impossible to defend given the data I present here. For the LDS traditional, the BOM is a powerful witness of Christ, but the modern content and the trends I illustrate here make it very difficult to match with any model that fits the traditional LDS perspective. For non-believers of BOM historicity, there is still no perfect model that fits the historical record and can explain the complexity and spiritual power of the book. It’s a mystery. For a variety of reasons, primarily unrelated to the subject of this post such as logic I explain in this CES Letter reply post, I am a faithful LDS and love the BOM and call it scripture, but I don’t believe it’s historical. I think there are a few good reasons to believe there was a preexisting text that Joseph didn’t write. I don’t find any theory satisfactory. I don’t believe it’s historical. I don’t believe it’s likely that Joseph wrote it himself. The conspiracy theories required for other theories are implausible. So, it remains a mystery to me. My faith is that it was inspired by God to Joseph. The actual mechanism of that, I have no idea. I love the Book of Mormon (more of of my testimony on that here). I testify it is God’s word. I have seen its transformative power in my life and many others. Though I disagree with the Book of Mormon Central’s analysis of the Roper Study chart, I hope my contribution is seen as faith building. This subject of computer wordprint analysis I think is still ripe territory for future work. It’s still a mystery, but I think in time this kind of analysis will provide more and more clues. I acknowledge (and so appreciate) the tremendous amount of work and research that you’ve devoted to this piece. My compliments. After reading about discovery after discovery of articfacts from 100(s) and 1000(s) of years ago – still being found today – I’ve reached the same conclusions you have; the BofM is certainly a faith based/spiritual narrative but I no longer believe it is historical. Side Note: I would urge everyone to watch the recent NOVA/PBS special titled “The First Face of America”; focused on a 13000 year old skeleton. It was so very, very revealing and helpful to me. Perhaps I am missing something, but I don’t see how anything you have found contradicts the classical model for the Book of Mormon as ancient history. The best possibility seems to be that Mormon either compiled his record from two sources ( a narrative and a sermonic/letter account), or alternatively that the narrative voice is his with an overly of existing documents and speeches. Moroni is influenced by Nephi’s earlier writing because he is the one that discovered and appended that record at the end of the text, and so his voice is heavily influenced by Nephi but also by his father and the earlier sermons. What am I missing? Which BoM electronic text are you using? Daniel Smith, it’s tied to the BOM Voices database project they did at BYU. I think it’s the most recent version. Which is kind of a bummer, because the first edition would be more accurate, but the Voices database is very important in separating out the narrative and sermon like I do. And I think analysis like this using the current edition is going to be 98% accurate, which is all I hope to be. I’m looking for trends and models. Very interesting post! Delving into the minute details of a text always fascinates me. I agree with you that the BoM is of modern origins, and I also agree that it seems incredible that Joseph could compose and dictate such a book in a 90 day span, even including the 13 months that the dictation occurred over. A quick search on LDS.org reveals many more sprinkled throughout the entire book, including Mosiah 7:27, Alma 13:7, Alma 32:16, Alma 40:19, Alma 48:15, Alma 46:21, 3 Nephi 3:7, 3 Nephi 6:20, 1 Nephi 8:2, and 1 Nephi 19:7. As far as I can tell, they seem to span all three N, S, and L voices. Curiously, it is also in Joseph Smith’s original preface to the Book of Mormon. I think all of these cases can be attributed to him. In a similar vein, there is a example in Mosiah 16:6 where Abinadi makes a flub and immediately needs to correct himself. And now if Christ had not come into the world, speaking of things to come as though they had already come, there could have been no redemption. These examples, particularly the last one, are rather difficult to explain as coming from a source manuscript, because unlike during dictation, an author can edit and fix mistakes as they write. If there was a pre-existing text behind the book, I think Joseph only used it as a loose guide and felt free to modify it as he needed. In this case, we would be looking at a very loose adaptation model, perhaps somewhat similar to the composition of the Pentateuch. Of course though, if this is the case, where is this manuscript that Joseph adapted from? The mystery continues! Speaking as a creative writer, I can say that the above statement is evidence, to me, of Joseph having written the whole thing, with at most editorial input from a handful of others. I have written a few full-length first drafts, including a novel for National Novel Writing Month. And a full-length play which I took through at least 5 drafts with professional input and public readings. These manuscripts, loved and ached over while I wrote them, are all buried in boxes now. I don’t hate them. I’m not embarrassed by them. I’m just done with them. They took up so much time and energy. Just a thought. Writers don’t always linger with their passion projects once they’re completed. Sometimes they move on, satiated and/or drained, and ready for new quests. The above is just rumination. It is not the deciding factor in my agnostic and generally unfavorable view of The Book of Mormon (minus a few of the S voices passages I find beautiful and moving.) I admire your dedication to this project, churchistrue. The numbers overwhelmed me but the broad strokes and your conclusions were very interesting. MRB fascinating example. I make the point that when I stumble across these kinds of things, invariably I find a pattern, heavier in N or S or L. Not so in this case. I just looked it up and no trend whatsoever. Very interesting. Samuel ‘s sermon has a very distinctively different voice. As an editor and writer it really jumped out at me. Read it out loud. “No traditional faithful explanations can explain the multiple voices. The best faithful explanation is that there are no multiple voices, and the voice is Joseph’s voice that comes through with translation.” I disagree. You’ve accurately identified three different genres in the Book of Mormon – narrative, sermon, and autobiographical. Your analysis of Mormon being able to shift from one genre to another is perfectly natural to me. When I write a historical blog post, I’m very detached (more third-person) and I try to sound more logical and reasonable. When I’m writing a personal post, it’s going to be autobiographical and more emotional. When I write a talk for church, I will similarly adjust my voice. In your theory of three men contributing different voices, you are saying each of them separately pretended, at different points, to play the part of Mormon (since Mormon’s contribution falls among all the genres). That seems less plausible to me than a single person using different genres. You’re saying that because multiple people fall within the same *genre*, it must prove that they are, in fact, a single voice. That is incorrect. There was a lot of pseudo-biblical literature in the 1700s and early 1800s – very biblical, tons of “and it came to pass” and chief captains instead of generals. But those similarities indicate a genre, not single authorship – they are all purposefully mimicking the bible. I can see your argument, and I think you make a good case. But I believe the data *can* be explained with a traditional orthodox view of the Book of Mormon. Mary Ann, OK, so we’re arguing with the assumption my model is accurate. It might not be. That would be embarrassing for me but it’s highly possible. 🙂 But, assuming it’s accurate, your explanation for N vs S is fine, for Mormon’s portion. but then we have Ether, Moroni, and the small plates. And the way it trends according to the model doesn’t allow for Moroni and Nephi to be coming from a different voice. And there’s no traditional explanation that early Mormon could have a unique voice from late Mormon, and Moroni and Nephi would correlate to the late Mormon. I think the only traditional LDS POV could be that it’s Joseph’s voice coming through in the translation and then we have stylistic drift to account for L. Which I think is very valid. But I don’t see how you could attribute the N-S-L to anyone ancient. Unless you say Mormon wrote the whole thing, which is not traditional LDS view. Late Mormon is autobiographical – his book is about his own life, and he talks in first person. It makes sense why it would sound different from his earlier summary of events from hundreds of years prior. 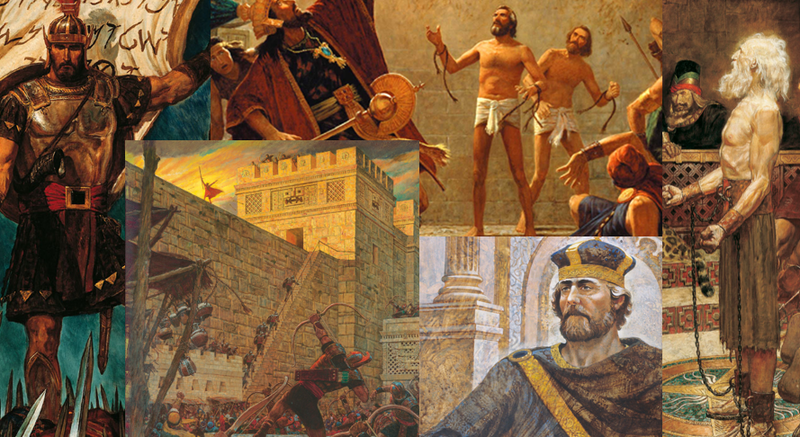 Moroni’s contributions (aside from his summary of the history of the Jaredites) is also autobiographical. Nephi (son of Lehi) is autobiographical – he’s writing his own history in the small plates. Your results are consistent with what the characters themselves are telling what happened. Edited to add: Same with Jacob and Enos – autobiographical. Nothing on the small plates (1 Nephi through Omni) was summarized or edited by Mormon. It was raw material. Same with Late Mormon and Moroni’s contributions – raw material – explaining events personally witnessed without being edited by a later figure. Mary Ann, OK, I understand you. So, you’re saying L Voice could correspond to autobiographical. That makes sense, but I don’t think my analysis is saying that. For example, if you look at the chapter by chapter chart, the first one under the L Voice section, the L Voice comes in abruptly either about Alma 63 or about 3 Ne 5, depending on how you look at the chart. But Mormon doesn’t really start getting autobiographical in a heavy way until way later. And also the L Voice patterns aren’t explained intuitively by autobiographical type reasoning. S vs N definitely are. But not L.
Now it really doesn’t decrease in Helaman and is still found in Ether. But after Ether the content becomes either more personal or sermon oriented. Churchistrue, but Helaman is where we get the Gadianton robbers, which Mormon blames for the end of his own civilization in *his* time period. The anger is palpable. To him, Captain Moroni represented the golden age. When the Gadianton Robbers come into the picture, he starts approaching the rest of the history as a cautionary tale for future readers –“Please don’t let this happen to you.” The benefit for the story line in Helaman is that we get Christ coming in 3 Nephi that kills all the bad guys and a utopia is created. Mormon doesn’t get to experience that light at the end of the tunnel–he doesn’t get to anticipate any future utopia for his people. And he gets more personal with the readers. You mentioned that the Spaulding-Ridgon theory, although your favorite explanation, has been “well debunked.” Can you go into more depth as to how you arrive at that conclusion? I realize that many LDS scholars discount this theory, but they have every reason to, because it’s not particularly faith-promoting. I personally consider the theory plausible, and use it as my own internal pet explanation for the coming forth of the Book of Mormon.